L&D Trailers announces the launch of their Oregon based dealership offering the full line of Britain’s Equi-Trek horse trailers and horse boxes. 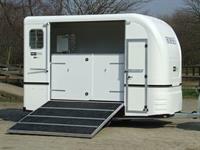 Equi-Trek is the largest horsebox manufacturer in the United Kingdom. 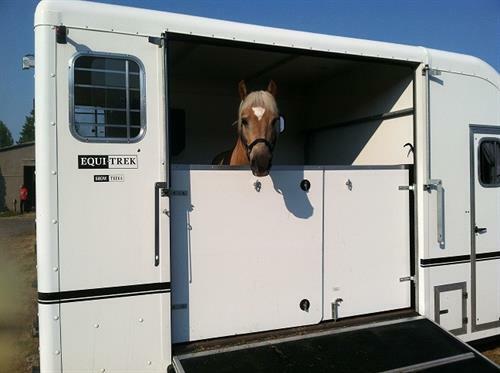 Equi-Trek Portland is the first dealership in the United States to offer this very popular and high quality line of horse transports. “ We did a lot of due diligence when shopping different trailer manufacturers and discovered that Equi-Trek is such a quality product, with construction that emphasizes safety and comfort for both horse and rider, that we are proud to offer it to our Northwest friends. Buyers want to know that this important purchase will hold its value, and we believe that we’ll see excellent resale value, plus durability and reliability. Initially, the Star-Treka and Show-Treka trailers (available with expedited delivery) will travel to regional horse shows, trailering clinics, and special events, so equestrians can get that close-up look at their unique design. Also, Equi-Trek Portland represents the full line of horse boxes and trailers, and we can custom order any of the special options. VISION - The Small Horsebox on US FOrd cab/chassis -NOW in the US!